This book is more than just the recollections of a young lady serving in an army hospital treating the wounded. To read the pages opens a window onto life for women during the 1860's. The book begins with her decision to serve as a nurse. The tale continues with her preparations, all being cast in the most noble and romantic view possible. Her trip from Boston to Washington, a trip that today is very uneventful, is described as an adventure which travel of even a couple hundred miles must have been at that time. 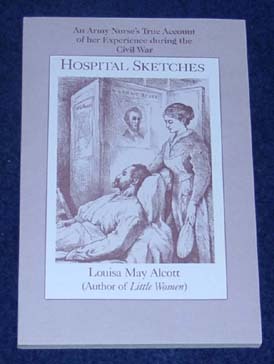 An interesting scene is painted at the beginning of the third chapter when she has the reality of the war comes to the hospital where she is assigned. They are all roused up and told, "they are coming," which, after several questions, they find out is forty ambulances of the wounded from Fredericksburg. About the only thing missing to make it a typical scene from another famous story about treating the wounded is a speaker system to blare out, "Attention all personnel. Incoming wounded." The balance of the book covers her experiences in treating the wounded and her observations of them. As might be expected, her prose leaves quite a few voids about the unpleasantness of the hospital which our imagination can fill. What she does provide is an interesting reflection on the attitudes during that time period regarding injury and death and the feelings she had in a situation that even now, for most people, would be a foreign and emotionally trying position.